Smaller city budgets have reduced the number of public Fourth of July fireworks displays on the Peninsula this year, but coastside and bayside residents will still have a few options to get out and celebrate Independence Day. * Foster City's Fourth of July celebration includes a fireworks display over the lagoon next to Leo J. Ryan Memorial Park. The fireworks show is scheduled to start at 9:30 p.m. The daytime celebration starts in the park at 8 a.m. and includes a pancake breakfast, a Stars and Stripes Dog Show and a Livin' in the USA live music show. * Coastside residents can head to Half Moon Bay this year to watch a fireworks display at the beach. The show, sponsored by the American Legion Coastside Post 474, is scheduled to start above Pillar Point Harbor at 9 p.m. The best place to watch the show is from El Granada Beach or Surfer's Beach, both of which lie just south of the harbor off state Highway 1. * East Palo Alto is putting on a fireworks show on Saturday at the Cesar Chavez Academy. 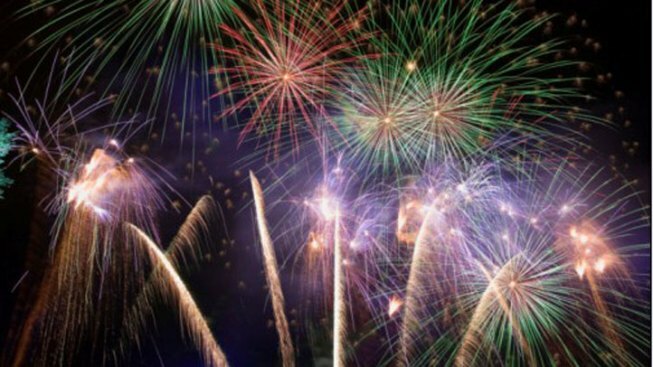 The gates will open at 7:30 p.m. and the fireworks are scheduled to go off above the athletic field along Bay Road at 9:30 p.m.
Fireworks can be legally bought and set off in Pacifica and San Bruno. Through July 5, approved "safe and sane" fireworks can be set off in Pacifica at Linda Mar and Rockaway beaches between 9 a.m. and 11 p.m. Fireworks are not allowed at any other Pacifica parks or beaches. Fireworks can be ignited on private property in Pacifica but not within 10 feet of a residence. San Bruno also allows limited sale and use of legal fireworks. They can be set off on private property between noon and 10 p.m. through July 3, and between noon and midnight on July Fourth. Redwood City, which has in years past put on a Fourth of July fireworks show, will mark this year's holiday with a downtown parade and festival with the theme "Redwood City Fire Department: 150 Years of Service." Several streets around the old courthouse will be blocked off to accommodate a 10 a.m. parade, a battle of the bands, car show and fire engine display. * Great America's Independence Weekend Fireworks - July 2-3 at 9:30 p.m.; 4701 Great America Parkway, Santa Clara. Free with park admission $34.99-$45.99, www.cagreatamerica.com. * Los Altos Glorious Fourth Independence Day Celebration: 11 a.m.-2 p.m. July 4. Shoup Park, 400 University Ave., Los Altos. Visit www.calendarwiz.com. * Milpitas' Red, White and Boom! July 4th Celebration. Fireworks begin approximately 9:30 p.m. July 4. Milpitas Sports Center, 1325 E. Calaveras Blvd., Milpitas. www.ci.milpitas.ca.gov. * Morgan Hill Independence Day: ntertainment and fireworks viewing will be located at Morgan Hill Community Park. Visit http://mhfreedomfest.com. * Palo Alto Summer Festival & Chili Cook-off. Noon to 5 p.m. July 4, www.cityof paloalto.org. * San Francisco Symphony Fourth of July Celebration. Preconcert entertainment begins at 5 p.m., symphony performs at 8 p.m. July 4th. Shoreline Amphitheatre, 1 Amphitheatre Parkway, Mountain View. $14.50-$35. www.ticketmaster.com. * San Jose Earthquakes. On July 2, the Earthquakes take on the New York Red Bulls at Stanford Stadium with a big fireworks display planned for after the match. Kickoff is at 7:30 p.m. and tickets are $15-$50 (www.sjearthquakes.com). * San Jose Giants Fireworks Extravaganza. Fireworks immediately follow the conclusion of the baseball games July 4-5. Games start at 6:30 p.m. Municipal Stadium, Senter and East Alma streets, San Jose. 408-297-1435, www.sjgiants.com. * Alameda's July 4 Celebration. The Alameda Mayor's Fourth of July parade begins at 10 a.m. July 4 at Lincoln Avenue and Park Street. City's Jumpin' and Jivin's Jubilee runs 12 noon to 4 p.m. at Ritter Park, Otis Drive and Grand Street. www.cityofalamedaca.gov. * Berkeley Marina's Fourth of July. Food, live entertainment, art and crafts vendors, free sailboat rides 1-4 p.m., dragon boat rides 2-6 p.m. Noon-9:30 p.m. July 4. Fireworks begin at 9:30 p.m. University Avenue. Free admission. 510-548-5335, www.ci.berkeley.ca.us or www.anotherbullwinkelshow.com. * Oakland A's Fireworks Night. See the Oakland A's battle the Arizona Diamondbacks at 6:05 p.m. July 2 and watch the fireworks show immediately following the game's conclusion. At O.co Coliseum. Tickets: $10-$200, 877-493-2255 or www.oaklandathletics.com. * USS Hornet Museum Independence Day. Live music on the flight deck, interactive games for all ages, and a bounce house for kids. Tours of the famous aircraft carrier will be available throughout the day. Fireworks can be viewed on deck. 10 a.m.-10 p.m. July 4. 707 W. Hornet Avenue, Pier 3 in Alameda. $25, $10 children. 510-521-8448, extension 282 or visit www.hornetevents.com.